Gharem frequently uses elements of Islamic art and architecture in his work. In this print, he overlays a simple image of an airplane and runway with a geometric pattern borrowed from mosaic tilework, which includes the Muslim profession of faith. 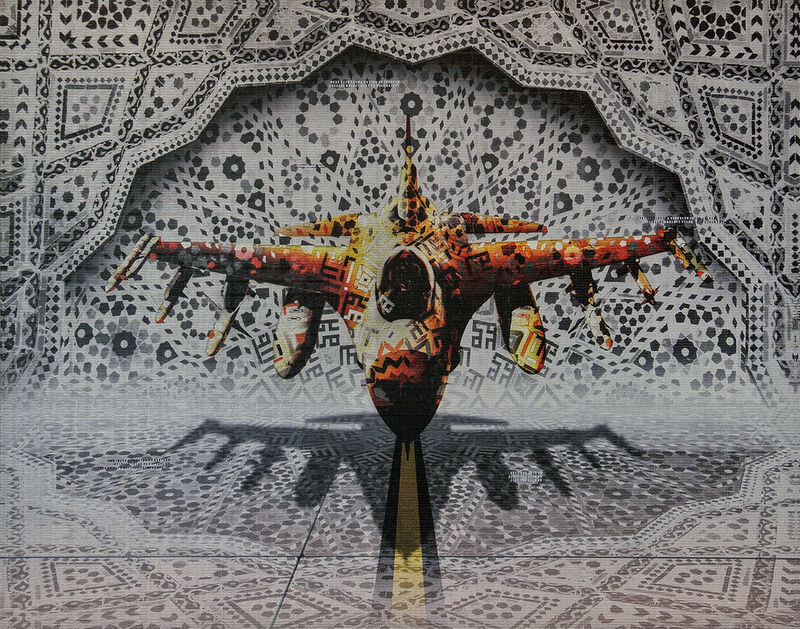 Similar to his iconic “stamp paintings” but rendered as a print, a second mosaic-like layer is formed by numerous small letters, some of which form fragmented quotes, shown in reverse and in English and Arabic. The quotes are drawn from former President George W. Bush’s “War on Terror” speech, tying the enigmatic image to contemporary politics. As with many of his works, the immediacy of this artwork conceals its multiple layers of meaning.